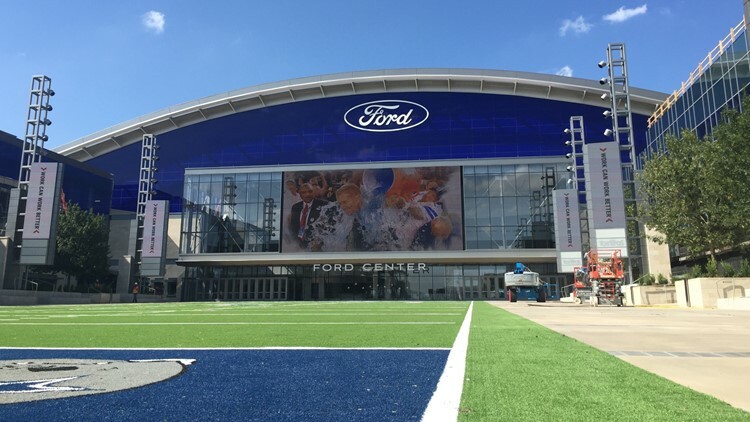 Exterior view of The Ford Center at The Star in Frisco, TX. Keurig Dr Pepper Inc. announced Thursday that it will move its Texas headquarters from Plano to Frisco. FRISCO, Texas — Keurig Dr Pepper Inc. announced Thursday that it will move its Texas headquarters from Plano to Frisco. The company will move about three miles away into a 350,000-square-foot built-to-suit, leased office building at The Star in Frisco, world corporate headquarters of the Dallas Cowboys football team. "We are thrilled to see the business community at The Star continue to grow with the addition of Keurig Dr Pepper," said Jerry Jones, owner of the Dallas Cowboys, in a news release from Keurig Dr Pepper. Speculation swirled earlier this week as Frisco City Council was set to vote on whether to sell Jones' Blue Star Land a parcel owned by the city at a discounted rate. The city council agenda said that the land would be used to develop a more than 300,000-square-foot office building at The Star in Frisco. The name of the would-be lessee for the office building was not listed, but real estate sources told the Dallas Morning News that Keurig Dr Pepper (NYSE: KDP) had been shopping for properties. The vote passed Tuesday night, giving Blue Star Land the ability to purchase 2.49 acres of land from Frisco for just over $597,000. The parcel is valued at about $2.7 million, according to the Morning News, and overlooks the practice field at The Star. Frisco Economic Development Corp. President Ron Patterson told the city council Tuesday that the estimated value of the office building would be about $190 million. One stipulation of the city council agenda said that the construction on the office building was required to start on or before Aug. 30 and that the project must be completed within 24 months. The dates line up with what Keurig Dr Pepper said in the release as the company plans to move to its new co-headquarters in 2021. Last January, Keurig Green Mountain Inc. announced it would purchase Dr Pepper Snapple Group Inc. in a $18.7 billion deal. The merger was completed in July, and the combined company, Keurig Dr Pepper, is dual-headquartered in Texas and Burlington, Mass. Keurig Dr Pepper has been in its Plano offices at 5301 Legacy Drive since 1998. The release also notes that Frisco Economic Development Corp. Board of Directors approved an incentive package to move Keurig Dr Pepper's 1,100 employees. The incentives are contingent upon fulfilling certain criteria. "Having this Fortune 500 company located in Frisco will continue to strengthen the city's position as one of the top corporate relocation destinations in the United States. With this move, Keurig Dr Pepper will have a direct impact on our city's corporate landscape for many years to come," Frisco Mayor Jeff Cheney said in a prepared statement. Keurig Dr Pepper Chairman and CEO Bob Gamgort said that the company is excited to upgrade its Texas co-headquarters. In the release, Gamgort points to enhanced enhanced technology capabilities, space to increase collaboration and attracting top talent as some of the benefits of the move.